What Are Country Trail Races Like? All Country Trail Races use written route instructions to guide runners along public rights of way. The route will mainly be off-road on footpaths, bridleways and tracks. This can mean anything from muddy paths to pavements, so a shoe for mixed conditions is recommended. The organiser will have had the instructions independently tested, so you can be assured that you will reach the finish if you follow the route to the letter. Navigation skills such as using a map and compass are not required, however it pays to keep your wits about you. The best trail runners are able to run quickly and read the next few instructions at the same time. Other runners will be out on the course, but it is best to stick to what you think is right rather than follow someone else. A great way to start is to run in pairs or small groups to share the route finding duties! Country Trail Races are entry on the day with no fixed start time. You can begin your run at anytime that you want within the starting window which normally spans an hour. However, we would recommend that slower runners start early as this will help results to be collated as soon as possible. The absence of a strict start time is ideal if you are delayed on your way to the race because you were busy at work, or faffed about too much before leaving the house! When you are ready to start, you must return to the start point with your instructions and ask for a start time. You will not have to wait more than a minute or so, however the starter will try to smooth out the flow of runners so there aren't big groups out on the course. The most important thing is to run safely, there may be hazards on the route such as road crossings and rough surfaces. You will be out on the route alone so be responsible, look out for other runners and respect the land over which the route crosses. Use the route instructions and follow each instruction in turn. The route is divided into paragraphs at regular intervals so you have a rough idea about how far you have run. When you arrive back at the venue you must check back with the starter to record your finish time - shout out your race number which will be on your instructions. Congratulate yourself on your run, once all of the runners have returned the results can be compiled. If the venue is a pub, why not stay for a drink or a snack while you compare your run with others and wait for the results? You will normally be given a voucher to spend as part of your entry fee! Country Trail Races attract many different types of runners. However, they are particularly enjoyed by those runners who like the countryside, race for fun but also have a competitive streak. The time trial format really encourages runners to put the effort in because they have no way of knowing how quickly the other competitors are running - These races can be a good bit of training if you go all out for it! 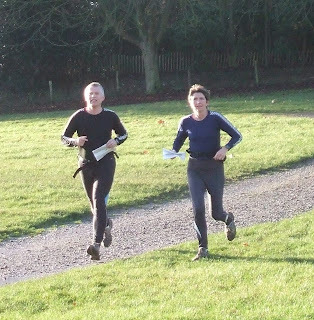 Country trail races are well organised events held under UK Athletics rules. The Organiser will apply for a permit from governing bodies such as the Trail Runners Association or UKA. The resources required on race day are relatively small because runners guide themselves around the route. Much of the work takes place before the event with the organiser plotting and testing the route, carrying out risk assessments, applying for a permit and negotiating for a suitable venue. However, the organisation of a trail race is not complicated, we've put together a guide to help you. Also visit the Trail Runners Association website for help or contact us to ask for advice if you are considering a race of your own.